Slovenia is a little country, but it’s blessed with scenic mountain landscapes, among which the Julian Alps take the lead in fame and popularity. 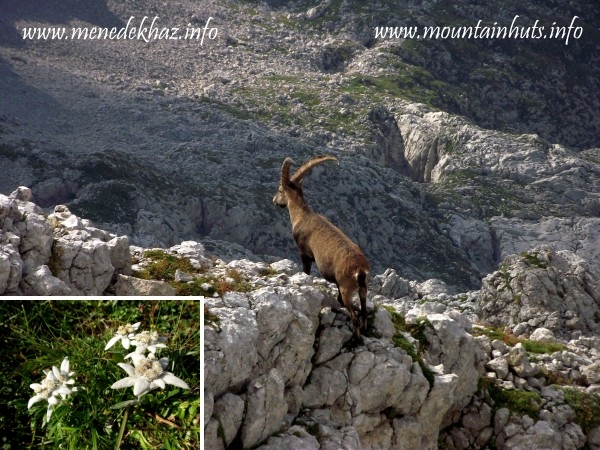 This spectacular range, with its jagged terrain, draws a large number of hikers and climbers each year, most of them aiming to reach the 2864 m high Triglav peak, the emblematic mountain of Slovenes. Although Triglav (a true national symbol, which is also featured in the country’s flag) gets the bulk of the attention, other parts of the range are nonetheless interesting. A good example of that is the neighborhood of the Pogačnik Hut. This particular corner immediately fascinated me upon my first visit to the area a couple of years ago (and I have to say, the magic did not fade at all since then). Quite probably I am not alone with that feeling, as the place is also traversed by the country’s most prestigious hiking trail, called Slovenska planinska pot (also known as Transverzala), that connects the major mountain ranges of the state. 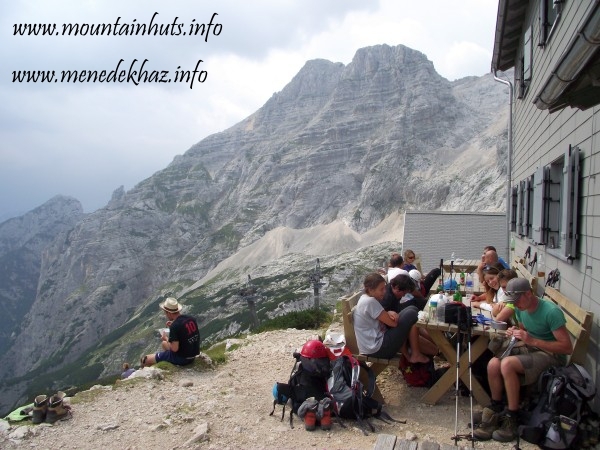 As usual, I will devote a paragraph to the – relatively short, but eventful – history of the hut (usually called in Slovene as koča – pronounced: koh-cha –, but sometime, just like in this case: dom), which is managed by the Radovljica section of the Alpine Association of Slovenia (PZS). The construction of the hut was initiated in 1948 and took years to complete, as all necessary materials were transported through the difficult terrain using only human and animal power. The official opening took place on the 7th of October, 1951. The facility was named after Jože Pogačnik, the young head of the financial committee of PZS, who suffered a fatal accident the previous day, slipping out on a snowfield on his way to the opening ceremony, while approaching the hut from the Vršič pass (pronounced as: "Ver-sheech"). The first major extension of the building was done in 1973, when the water supply was solved and the interior parts got refurbished as well. Ten years later, a cableway was set up from the Zadnjica valley, which eases the supply of the hut considerably ever since (the line was completely renovated in the beginning of the new Millennium). In 1985, the mansard of the cableway’s upper station was developed into a winter room, which can be used as a bivouac for free in off-season, when the main building remains closed. Solar PV panels were mounted in the nineties to produce off-grid electricity, the roof and the facade of the buildings were replaced in 2004, and finally, a wastewater treatment facility was put into service in 2014. 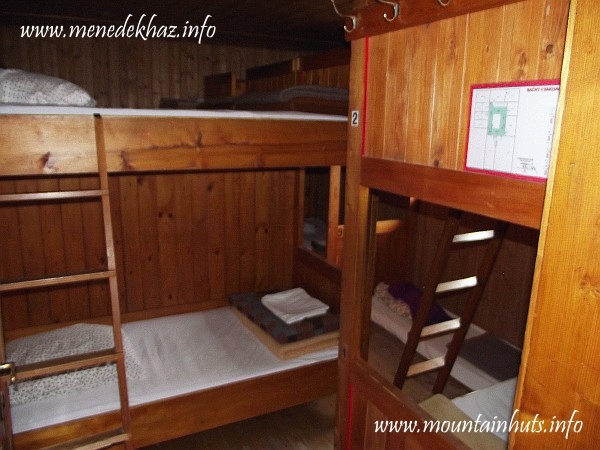 The chalet is clearly well-managed and is continuously upgraded by caring hands. The Pogačniik Hut can be approached from various directions, none of which would I classify as an "easy stroll". The most obvious starting points are: the Aljaž Hut (Aljažev dom) in the Vrata valley, and Trenta village in the valley of the Soča river (both of which can be accessed by car). In the former case about 1200 m of ascent and 150 m of descent awaits us (including a few short sections where iron pegs and cables ease the climb), while the latter option comes with a steady 1400 m of ascent through the Zadnjica valley. The distance covered by the two routes is roughly equal (approx. 7-8 km), but in these mountains it’s rather the elevation difference that counts (more on this later). 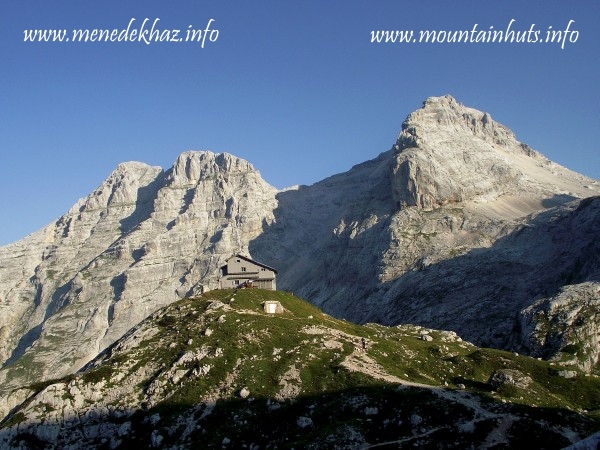 If you would choose the Aljaž Hut as a starting point, please note that there is a parking fee to be paid between 15 June and 15 September (the daily rate is 3.5 €, but sometimes multi-day stays are not charged more than one day). The Transverzala route from Vršič pass is a more challenging approach that includes exposed and hard sections, hence it is rather recommended for those who already gained experience in these mountains and are equipped with a light and compact backpack. The hut has an excellent location, perched on a small hilltop on the lower edge of the giant karst amphitheater called Kriški podi (which is sometimes referred to as a "plateau", but that’s a heavy exaggeration). The view is therefore fabulous, regardless of our orientation: from the outside terrace we can see deep down into the valley of the Soča river, spotted with the tiny houses of Trenta; while looking in any other direction, the jagged peaks and ridges of Kriški podi compete with each other for our attention. I will return to these at the end of this article, but for now, let’s have a look inside the hut! The main entrance opens from the terrace into a small "buffer" room containing a large basket for storing trekking poles and a shoe-shelf for overnight guests (the shelf is divided into numbered boxes where you can place your boots and exchange them with the provided slippers for indoor use). From here we enter a more spacious lobby. Right in front of us we find the washroom of the ground floor (with one separate toilet for male and female guests) and the stairway to the upper floor. Turning left, we scan see the kitchen (staff only) and approach the dining room. The latter is officially designated for 45 people and also serves as a community room (the reception desk is located here as well). You can even find sockets for loading electric devices or batteries, too. In case of bad weather, the big tiled stove in the center of the room must be a popular place for drying wet clothes (hangers are provided around it). In good weather it is much more humane to use the outdoor clotheslines, and let the sun and the wind do their job. In this case, it is strongly advised to use the provided clothespins – not only for the wind, but also because of the sheep that are grazing around the hut, as they are very, very eager to get salt (even if it is "served" on clothes). Talking about alimentation, let’s devote a few words to the meals available in this hut. In a nutshell: they are tasty and come in hearty portions. The actual offer, which varies from one day to another, is presented on the blackboard by the reception desk. If you are not familiar with the Slovene kitchen lingo, there’s also a printed menu around with English translations (containing the entire repertoire, so don’t just expect anything to be an option anytime), but the staff is also very helpful and they will explain what kind of dish do the names stand for, if you ask. The price of the main courses is generally around 6 €, while the breakfast (available from 6 am) costs 5 €, for which you can get either "ham-and-eggs" or simple scrambled eggs with bread. Drinks have to be ordered separately (their coffee is tasty, sold for 2 € per cup). Dinner is served until 9 pm, but it’s not worth to wait for too long, as they might run out of your targeted dish meanwhile (pre-orders are not taken, business goes according the actual demand and supply). A note for beer lovers: the price of a bottle (0.5 L) of Zlatorog is 3.6 €, slightly high in Slovenian context, but nevertheless it’s a very popular goodie (when the house is full, the cableway keeps coming and going with beer racks). It’s also worth noting that the tap water, drawn from a spring located above the hut, is potable (I would also dare to say it has a good taste as well). Sleeping rooms for 4-12 persons (with bunk beds) are located on the upper floor, altogether offering 37 places. On this floor we also find the bathrooms reserved for overnight guests (these are more spacious than the ones on the ground floor). Depending on the time of day and the actual usage, warm water is available from the taps, but do not count on showering possibility (this would be the only reason why I wouldn’t classify this chalet as a "wellness-hut", but bearing in mind that you still have access to warm water in a karst range over 2000 m, this title may even be deserved). From the upper floor, a narrow but comfortable stair leads up to the mansard (watch out for the head clearance). This room, divided into several smaller chambers, provides basic accommodation on 22 comfortable matrasses. Clean pillows and blankets are provided for each place, but it is customary that guests bring their own lightweight sleeping bag. A very clever solution is that each chamber has a wide platform along its inside perimeter, where all our belongings can be stored with ease, so the narrow walkway doesn’t have to be blocked by dozens of scattered around bags. Featuring only two small windows in the opposite ends, the natural lighting of the mansard room is limited (electric lights make up for this shortcoming), and so is the air flow (getting a place near the window puts you into power and responsibility for the latter). Nevertheless, it makes a very comfortable sleeping place in its category. One last thing worth of an additional note; the chimney is located near the central chambers – getting a place there you are guaranteed not to feel cold during the night (on the contrary, it is more likely that you’ll try to get rid of as much of your clothes as possible). 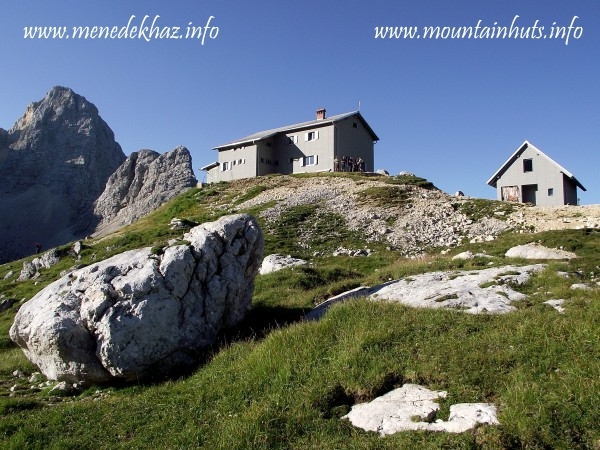 The hut is offering services from the second half of June until the second half of September (in this period also functioning as a mountain rescue station). In high season the main building is usually fully booked for the weekends. In such case, additional matrasses are laid out on the alleys of the upper floor and if needed, the winter room (in the other building) is also opened, where 20 more people can sleep (on matrasses as well). Altogether, the chalet offers accommodation officially for a total of 79 guests. Of course, in case of emergency, you can always get overnight shelter in the dining room even if all the official places are taken. In 2015, the accommodation prices (per person, for one night) were as follows: 28 € in small rooms (with 4 beds), 24 € in larger rooms (with 7 to 12 beds) and 16 € on matrasses, plus an additional 1.26 € tourist tax uniformly applied in all cases. Showing up your PZS or Alpenverein membership card entitles you to pay a greatly reduced price (only 50% of the normal rate). Booking in advance is generally recommended, especially in July and August. The best way of doing that is by phone, since you will get an instant answer (the personnel speaks English very well). Pre-payment is not required, all payments are made on the spot, in cash. In off-season, only the winter room is left open (which can be heated with the prepared wood). Here the places are taken upon arrival and payment for the accommodation is voluntary, just like in many other Alpine huts. Last but not least, let’s have a look at what does the area offer for us. 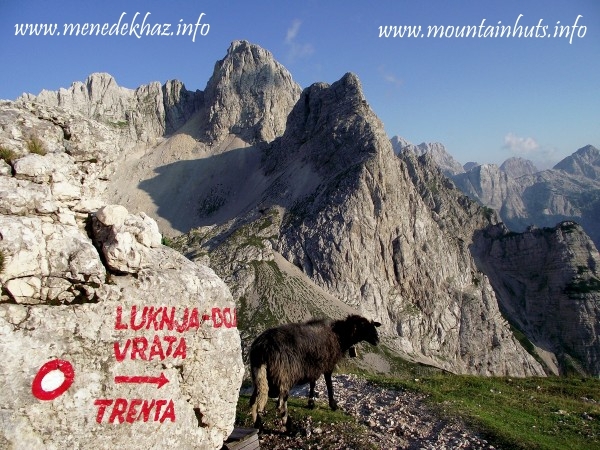 In the close vicinity of the hut there are no less than six remarkable peaks (Planja, Razor, Križ, Stenar, Bovški Gamsovec, Pihavec) with waymarked routes leading up to the top, but going a little farther you can even reach Dolkova špica and Škrlatica (the latter one being the 3rd highest peak of the Julian Alps, and the 2nd highest of Slovenia). Each one of these deserves to be visited, but bear in mind that only Stenar (2501 m) is accessible on a relatively easy route. For the rest we need to make use of artificial steel aids (cables, pegs, steps) as even the normal routes involve some airy, exposed sections that are secured this way. Such routes are denoted on the Slovenian hiking maps by dotted lines, whose official meaning is given as "hard or secured route (via ferrata / klettersteig)", and that is not a joke. These sections indeed require basic sure-footedness and not being afraid of vertigo, but in some spots it also makes sense to use ferrata gear (e.g. under the peak of Razor, where the route was changed in 2013, as the old one was swept away by a rockslide), so better be prepared for all of that. On the other hand, don’t be surprised to see that most locals easily walk (or sometimes jog) over the hard parts with wide smiles… they just belong to another league, getting used to moving around on unstable, exposed rocky terrain already in their childhood. Getting back to the routes, it is worth noting that in Slovenia (as in the other ex-Yugoslav states) all hiking trails are uniformly waymarked by the Knafelc blaze (white dot inside a red ring), the different routes being distinguished from each other by numbering, and the directions are clearly indicated by red signposts in intersections. At first sight this might be strange for those who are used to other systems, but we can soon familiarize ourselves with it. Just like getting used to the fact that in the Julian Alps it is the elevation differences that we have to primarily take account of, and not the distances, for it is a rather common situation that our route involves consecutive sections of ascending and descending several hundred meters (of course featuring inevitable unstable rocky slopes) right after each other, while covering only a kilometer in bee line. Keep that in mind when you’re planning the hikes!